One of the best hostels of our trip so far. Very cool atmosphere, nice pool and bar area, great breakfast buffet (so worth the 50 pesos! ), very helpful staff and owner with really good recommendations. Tower Bridge is 100% one of the best hostels in puerto escondido. I stayed for a couple of nights in a private 3-bed room, which was really big with comfy beds. The only downside was that it had no fan and the en-suite was separated from the room only by a curtain but whatever I was into it. I’ve also stayed in the big dorm which is really comfy as well, and has fans. The hostel staff are also super fun (shoutout to Ellen and Lea!) and are up for hanging out every evening. Super social hostel with all the facilities and activities that you will need. Free beach shuttle in the morning, good breakfast, lots of hammocks, kitchen, decent pool, pool table and a bar with backpacker prices. We really couldn’t ask for anything more! Staff are really friendly and the rooms clean. Made some great friends here! Beautiful hostel, great atmosphere. One of the best places to stay in Puerto. Tower bridge is excellent value for money. Pool is amazing! Shuttle to beaches handy. 20 min walk from bus station, few restaurants near but Oxxo 100m. Guest kitchen often gross from untidy guests but it was lovely after cleaning in the morning. Some non plastic cups/bowls would be nice as hot plastic isn’t great for health. Only 3 toilets but never had to wait. Very social but no party pressure. Water bottle refill is 5 pesos a day, no outside alcohol while bar is open, breakfast 50 pesos pp. The hostel is not in the center of town but they offer a free bus to the main beaches everyday at 11:00 am which is very nice. I highly recommend this place if you want to get the puerto escondido and not want a super crazy hostel but still want to socialize! 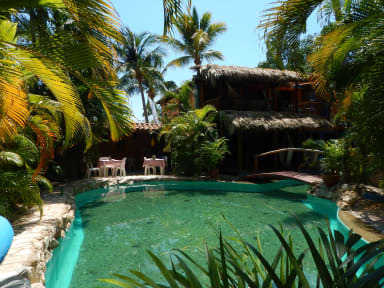 Great place to stay in Puerto Escondido! With the best staff and owner, the bar, the pool with volleyball net, fooseball and pool tables, great privates and dorms; I cannot think of many flaws this amazing hostel has. Be careful though, you might catch the bug and never want to leave..
Nice hostel, the owner is really friendly. The bar area is cool and it’s in easy walking distances to the beaches. Loads of volunteers work there which make it a bit cliquey but it’s still cool. Amazing common area with super nice volunteers and atmosphere! Totally worth it! The double room is very simple tough!